Preliminary Chart of the Pacific Coast from Point Pinos to Bodega Head, California. An uncommon and highly appealing 1862 U.S. Coast Survey nautical chart or maritime map of San Francisco Bay and vicinity. The map covers from Bodega Bay and Tomales Bay, in the north, southward as far as Monterrey Bay, inclusive of San Pablo Bay and San Francisco Bay. The city of San Francisco is highlighted. The map offers a wealth of maritime detail including countless depth soundings, identification of various rocks, shoals, and other undersea dangers, and notes on light houses, light boats, tides, magnetic variance, and soundings. The whole was compiled under the direction of A. D. Bache, Superintendent of the Survey of the Coast of the United States and one of the most influential American cartographers of the 19th century. 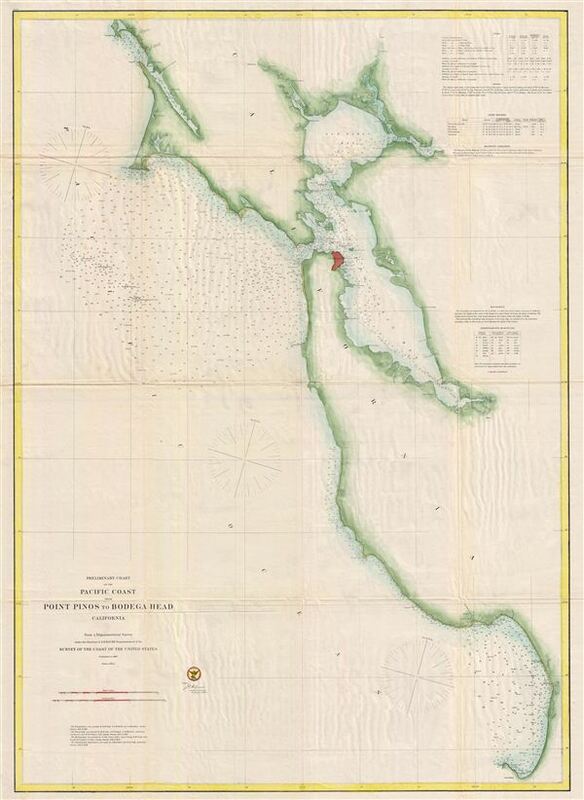 Published in the 1862 edition of the U.S. Coast Survey Superintendent's Report. Very good condition. Original fold lines exhibit some wear, verso reinforcement, and toning.